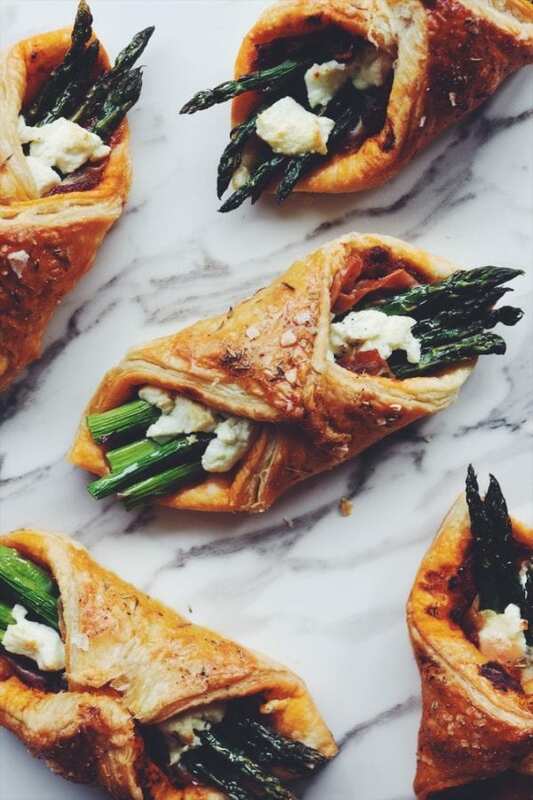 These baked asparagus puff pastries are filled with goat cheese, prosciutto, and sun dried tomato spread. 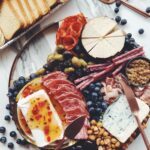 They’re the perfect flavorful little appetizer bundles for brunches, dinners, and special occasions. 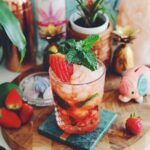 I love them served warm but they’re pretty great at room temperature, too! 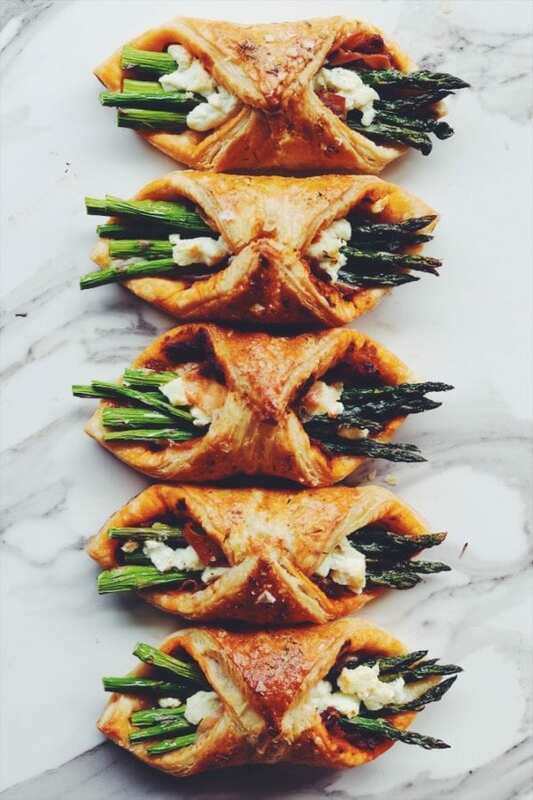 These baked asparagus puff pastries are not only insanely delicious but they’re super cute, too! 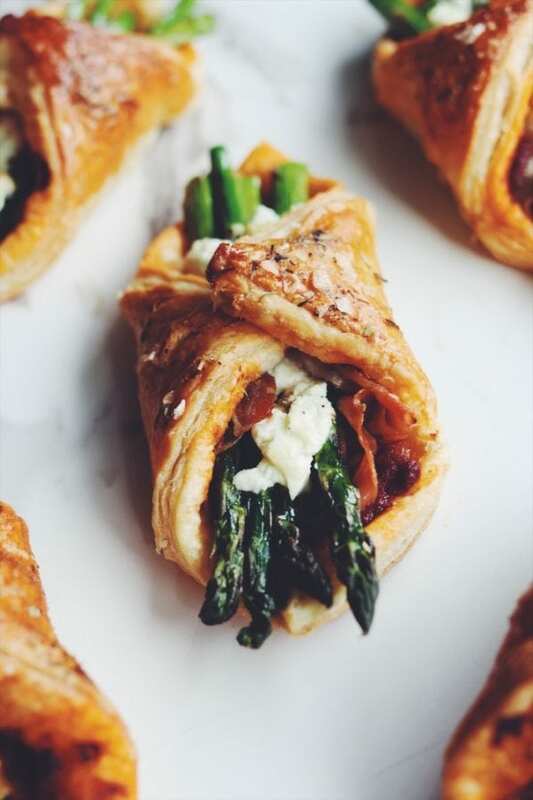 They’re loaded with tangy goat cheese, rich sun dried tomato spread, salty prosciutto, tender baked asparagus, and flaky puff pastry. Before being baked, they’re topped with herbs de provence and flaky salt. 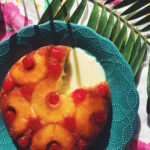 The result is like something out of a French bakery… except you can make it right at home with little to no prep work! I’m not going to lie, I ate about 4 of them straight out of the oven and they were amazing. 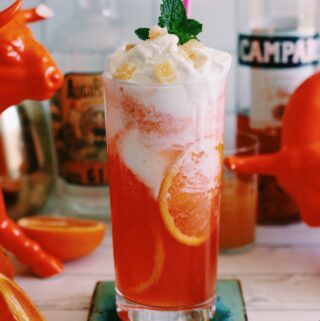 And later on, I had another one at room temp and it was just as good! 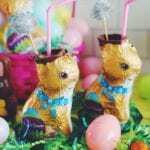 I think they would make the perfect little handheld appetizer for Spring-themed brunches, baby showers, and bday parties. 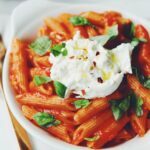 And if you’re a vegetarian or preparing them for one, you can totally just leave off the prosciutto and it will still be just as delicious! 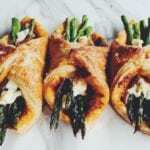 Making these baked asparagus puff pastries are super easy! To begin, preheat your oven to 375F. Next, roll out 2 sheets of thawed, store-bought puff pastry on a cutting board. Cut each square into four tiny squares so that you have 8 squares total. 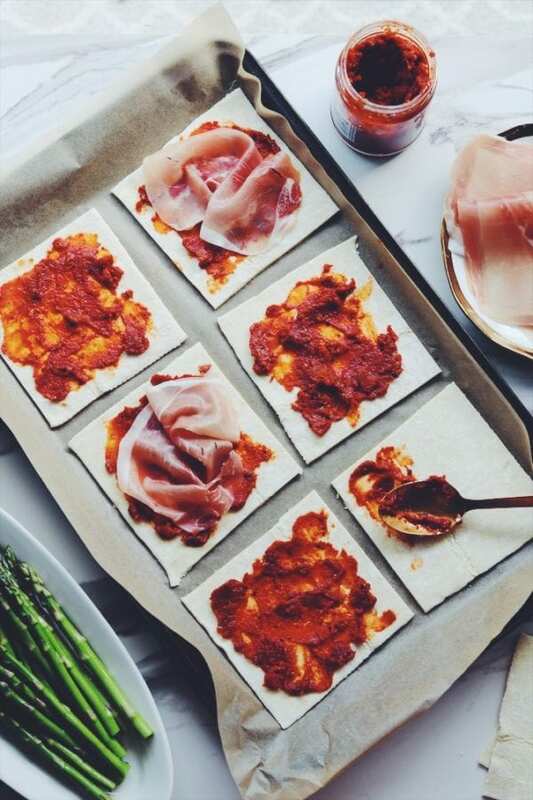 Spread some sun dried tomato paste on each square then top with a piece of prosciutto. Then, add a few stalks of trimmed asparagus and top with some goat cheese crumbles. 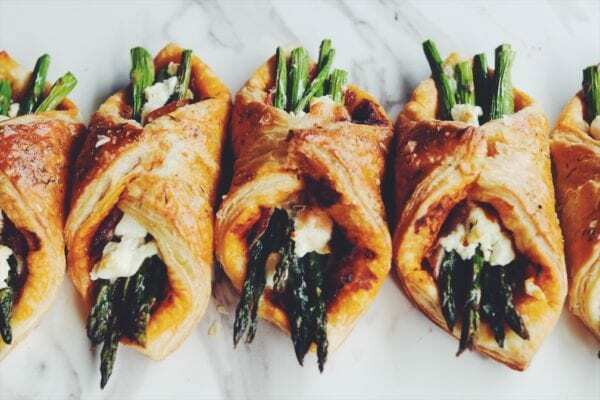 Before baking, take the two outer edges of the puff pastry and pull them into the middle – so that it looks like the pastry is now hugging the asparagus. 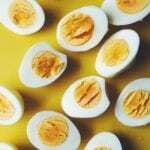 To seal the bundles, brush each one with whisked egg white. Be sure to add some under the flap so the pastry glues itself together. Sprinkle each one with a little bit of flaky salt and a few pinches of herbs de provence. Laslty, bake for 20-22 minutes or until the pastry is cooked through and golden brown. If some of them get separated and open up during the baking process, don’t worry about it. 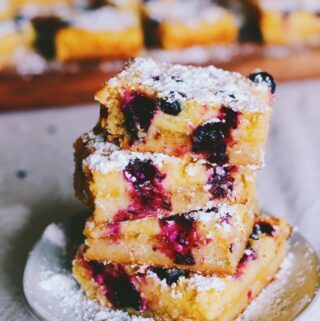 When they’re all done baking, you can essentially make them stick back together by propping them up against each other or on the side of a pan. Oh, and pro-tip, if that does happen and you can’t save them, use the ugly ones as a taste tester! Carefully fold each puff pastry in the middle so it looks like its hugging the asparagus. Brush whisked egg white over each puff pastry and put a little underneath the flap to help it stay in a bundle shape. Evenly space the puff pastries around the baking sheet and sprinkle each one with a few pinches of herbs de provence and some flaky salt. 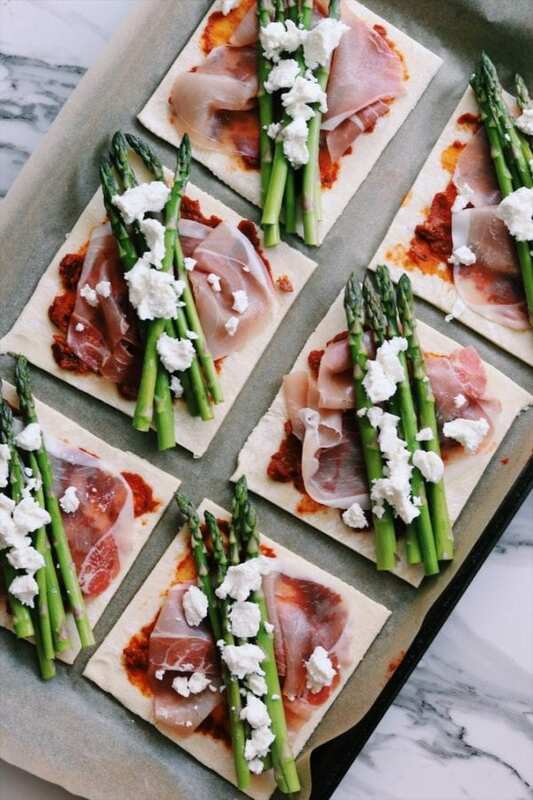 Bake for 20-22 minutes or until each puff pastry is golden brown and the asparagus is cooked. Remove from heat and enjoy warm or at room temp. 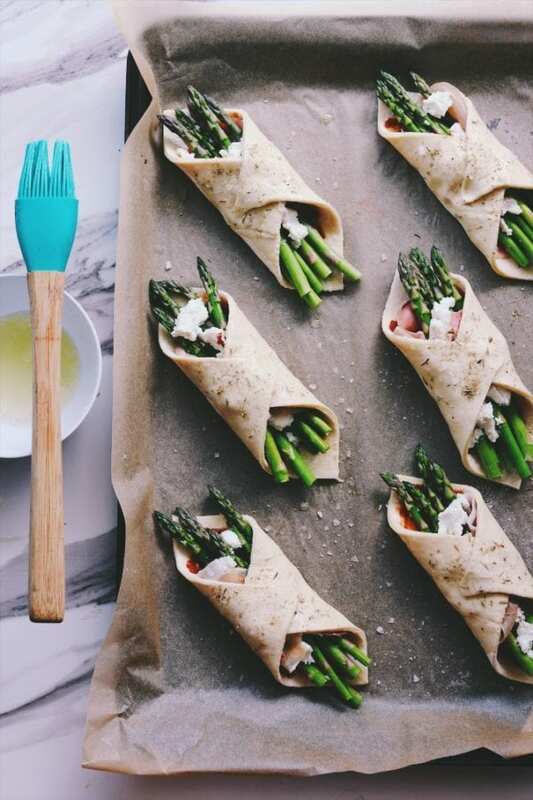 If you like this baked asparagus puff pastry recipe, you might also like one of these fresh recipes, too! 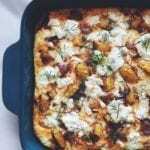 Summer Squash Frittata with Goat Cheese, Caramelized Onions & Dill – This summer squash frittata is filled with tangy goat cheese, fragrant dill and sweet caramelized onions. It’s the perfect cheesy baked brunch dish to make for a crowd. 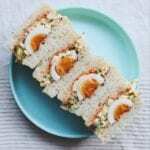 Enjoy it with a lightly dressed green side salad and a toasted croissant. 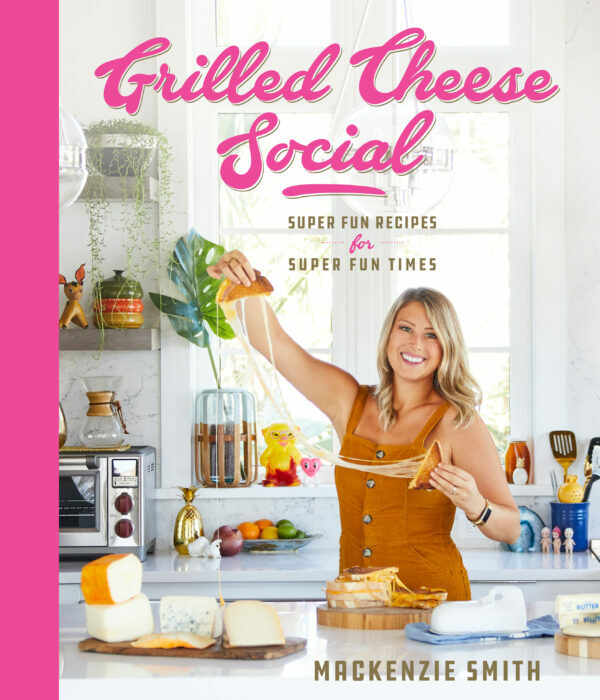 I think you might also be interested in my new cook book, too!